If your brand is big enough, you can heat up your business anniversary by rewarding customers with cold cash. That’s the approach taken by Mondelēz International for the 115th anniversary of its Nabisco brand. 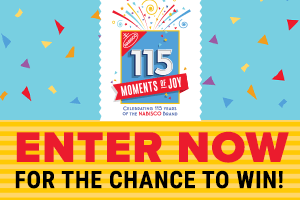 Through a “115 Moments of Joy” campaign, Nabisco is showering cash prizes for each day of the final 115 days of 2016. It’s a multiple touchpoint approach: think Facebook, Pinterest, iHeartRadio, secret shopper prizes, and one big $115,000 payoff. Strong on marketing, soft on heritage — the Mondelēz parent company website offers a scant paragraph of history for each of its numerous brands, with no timeline or “About Us” page or special treatment devoted purely to Nabisco’s 115th. Still, the multi-contest-touchpoint approach offers lots of opportunities for customer engagement. Worth studying if you’re a major retail brand.